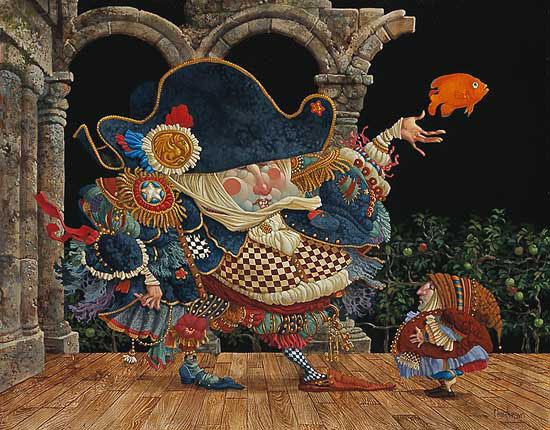 In the fantastic world of James C. Christensen’s paintings, fish are a symbol of magic and wisdom. “Their floating presence in the air reminds us that anything is possible,” says Christensen, “and those touched or surrounded by fish are considered truly blessed. When the fish don’t arrive, however, sometimes a person will take matters into his own hands, with compelling but less-than-convincing results. “When The Greenwich Workshop first approached me about transforming False Magic into a bronze sculpture I was surprised, but it turned out to be a brilliant idea. As soon as we had constructed the rigging I knew it was going to be great; the creative work and art of many people have taken False Magic and made it real magic.” Meticulously crafted, superbly detailed and stunningly translated into three dimensions, this sculpture will provide real magic wherever it finds a home.